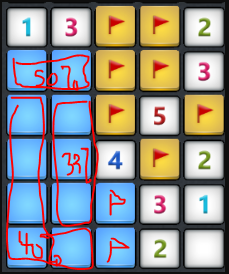 I've run into another "unsolvable corner" (corner of a puzzle where there isn't enough information to be 100% certain that any particular square that isn't a mine). Which squares in the below puzzle have the highest chance of being safe, and what are the chances I can fully solve the puzzle based on the clues present? There are 6 mines remaining. 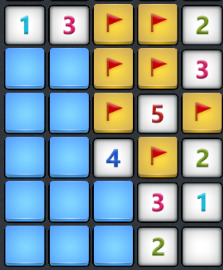 You should fill in the two bottom middle boxes as being flags, because they are 100% mines. Then, the top two squares remaining contain at most 1 flag. The chance of guessing a safe square is 50% (see diagram). The three squares in column two that are touching the 4 each have a 1 in 3 chance of being a mine (there is definitely 1 mine somewhere in those three), so the chance of guessing a safe square is 67% (and the chance of being a mine is 33%. The remaining five squares have 2 mines, so there is a 40% chance of guessing the mine and a 60% chance of guessing a safe square. Take a guess at one of the three squares in column 2 that are touching the 4, that will give you the best odds.